Find hotel near Iglesia Nuestra Senora De .. The Greek style church inside Apolo Park has quite interesting origin. 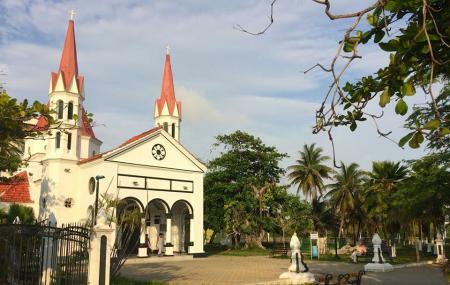 It was a gift from four-time president of Colombia Rafael Nunez to his wife Soledad Román as she was not allowed to bring in the other churches at the city. You see, she had married a divorced man, and had become the subject of a major scandal in 19th century Cartagena. It’s a pretty building of white walls and red roofs with cute little towers. The mausoleums of the president and his wife are on either side of the altar. Rafael Nunez’s house and monument aren’t too far away. The church is a popular place to hold weddings. The opening hours given here might not be accurate. Call the church ahead of your visit to know about more. Muy bien organizada y ambientada. Cuenta con un parque muy atractivo para lograr acceso a ella y donde realizan actividades por temporadas como ferias las cuales son espectaculares. Es una de las pocas iglesias con aire acondicionado. Iglesia plagada de historia, capilla construida por Rafael Núñez para su esposa, construcción hermosamente conservada.